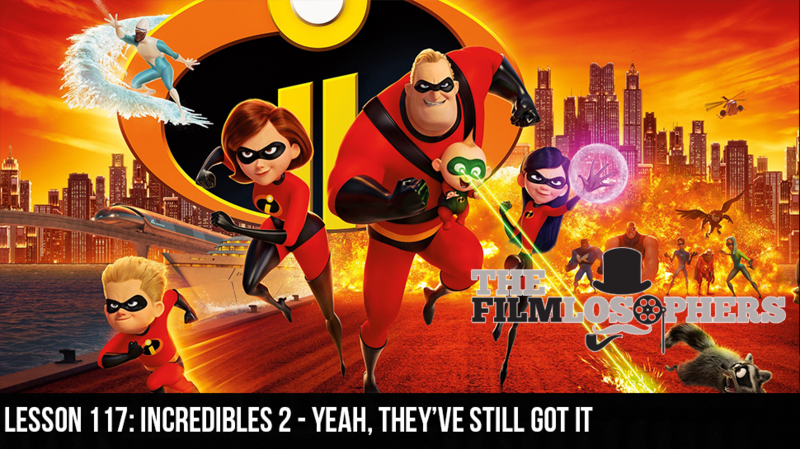 The Filmlosophers, Eddie Villanueva, Chad Riley and Spencer Williams, exercise a few new superpowers with this week’s review of Incredibles 2 (2018) from Disney Studios and Pixar Animation. They say absence makes the heart grow fonder, and many have been wondering if this long-awaited sequel would live up to the stature of the original film released in 2004. We’re happy to report that Mr. Incredible, Elasti-Girl, Violet, Dash, Jack Jack and Frozone are all back in action as if nary a moment has passed…and it’s an absolute delight.